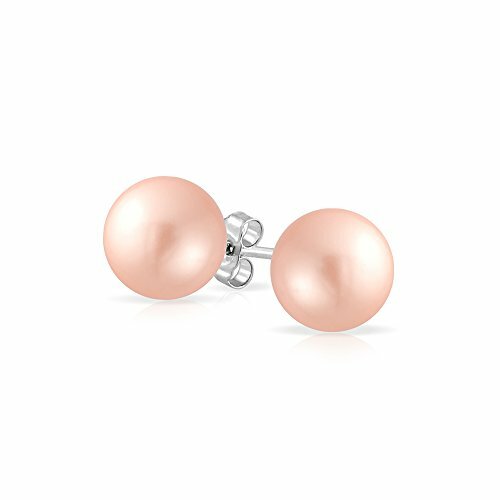 This classy pair of 8mm simulated pink pearl stud earrings in sterling silver would make a fabulous present for any fashionista. As bridal earrings, simulated pink pearl ball studs will add sophistication and elegance to any wedding day look. Simulated pearl jewelry makes a sublime option for June birthdays, so pick up a pair of these lovely pearl stud earrings as a birthday gift for someone special. Ladylike and luxe, you will love our darling, pink simulated pearl, sterling silver stuf earrings. Featuing a glowing, 12mm simulated pearl ball stud with hypoallergenic sterling silver. Charming option for June birthday.